I don’t buy that many new patterns but as soon as I saw this one, I knew it was meant for me. It was time for me to address the sad state of assorted past makes and retired daywear that I usually call sleepwear. Of course, that’s what I should have been doing. Sadly for my family, these pyjamas are not going to replace my current motley crew. As soon as I started sewing them, I realised that they were actually meant for somebody else, whose birthday is just around the corner. Maybe the next pair will be for me! It’s nearly Spring here, so the short version was the obvious choice for me to make. I thought long and hard about what fabric I wanted to use. If I was going to take the time to make a pair of pyjamas, there’s a good argument for making them in something special. I toyed with the idea of silk CDC polka dots and even Nani Iro, but in the end, I shopped from my stash and came up with a lovely Art Gallery cotton voile, leftover from some wrap pants I made last Summer. I also found some beige silk organza that matched perfectly for contrast in the cuffs and hem edge. The pattern itself is great. I am so impressed with the design and the fit. The pants/shorts sit on the hips, without looking baggy around the bum, and the shirt fits more slim and comfortably than I was expecting. I chose my size based entirely on the pattern packet and it worked out perfectly. I’d normally expect most shirts (of my bust measure) to be a bit tight through the shoulders. The shoulders are a perfect fit for my broad build. Others with narrower shoulders might find the shoulder seams to fit a little wider, which I suspect is what the pattern was intended to look like anyway. I made no modifications to the pattern, apart from the organza panel at the bottom of the hem. This was a pretty simple modification, but it did involve a bit of craftiness around the seams. I will confess that I did not use French seams throughout the majority of this shirt. However, French seams in the organza were essential, so I made sure to finish the cuffs in this manner too. 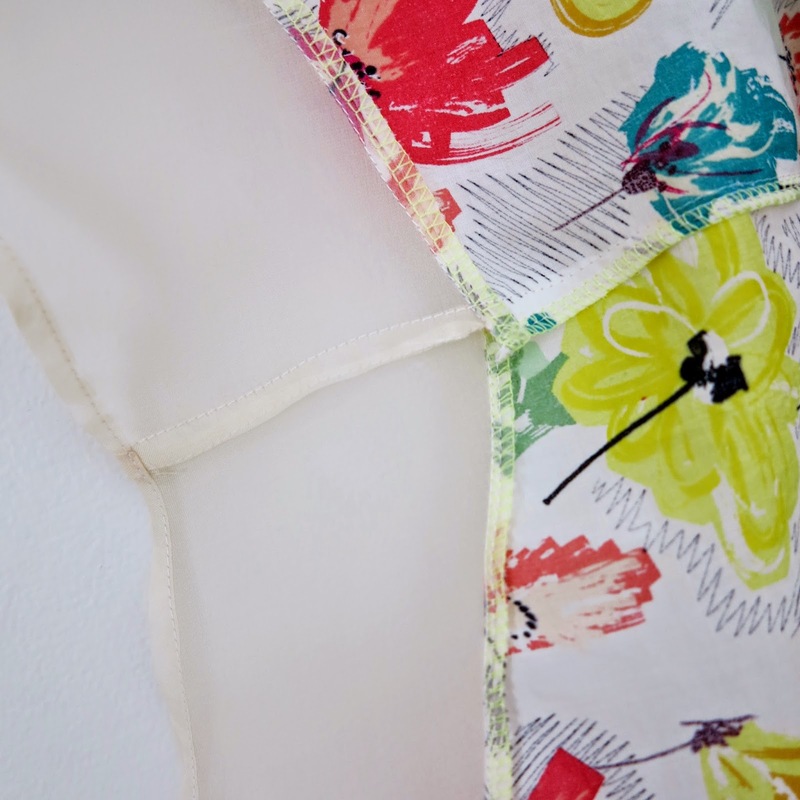 The side seams are half serged, half Frenched, in the same way you would do a French seam beneath an invisible zipper. This entry was posted in Closet Case Files, cotton, organza, pants, pyjamas, shirt, silk, top on February 20, 2015 by Debbie Iles. It’s all style here in the House of Iles. We’ve moved into the domain of velour tracksuits and we’re loving it. I found this cute little pattern a little while ago, Kwik Sew 1034. 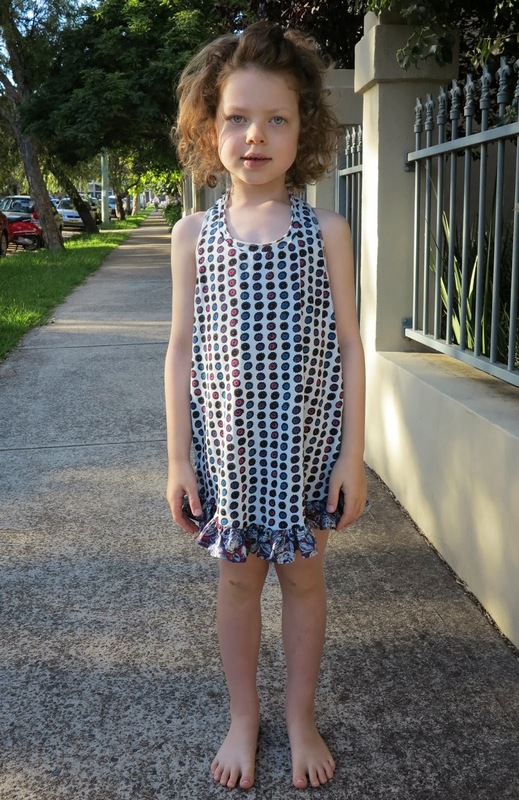 My pattern only started at a size 7 so I knew it would be a little large for Miss Four. But I also knew that she wouldn’t mind. 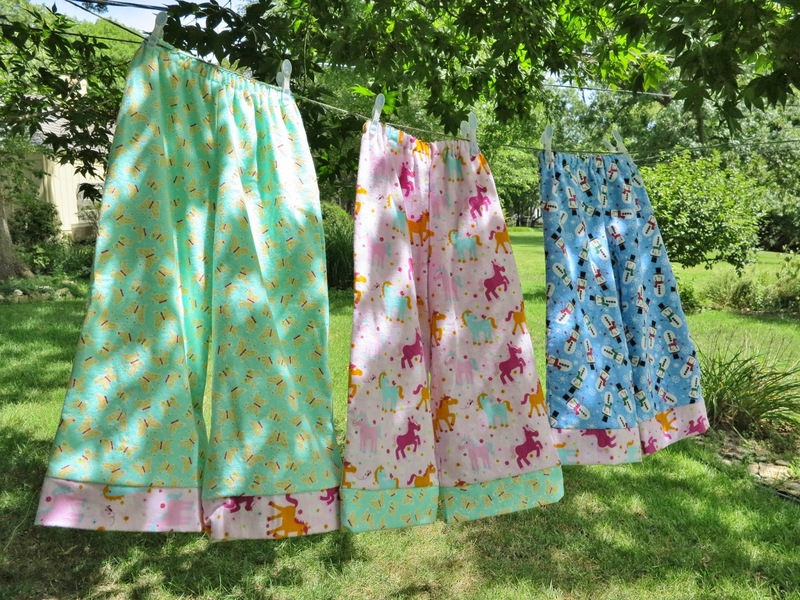 I’m quite fond of Kwik Sew patterns. This one was designed by Kerstin Martensson. I can’t fault the fit or the design, even though it swims on my daughter. It would probably fit her older sister better, but everybody agreed that this top was made for Miss Four. The fabric I used for the banding and the trim wasn’t the best suited for the job but my choice was based on what I had in my stash. The white is a lightweight, fleece-lined sweater knit of unknown composition. It feels lovely and soft but it doesn’t have the easy stretch and recovery of a ribbing. The only modification I made to View C was to add the contrast shoulder panel. This was purely because I didn’t have enough velour left for full sleeves. I really like the look of sleeves when you piece the shoulders with a bit of contrast. It’s simple to do but it really changes the look of the top. 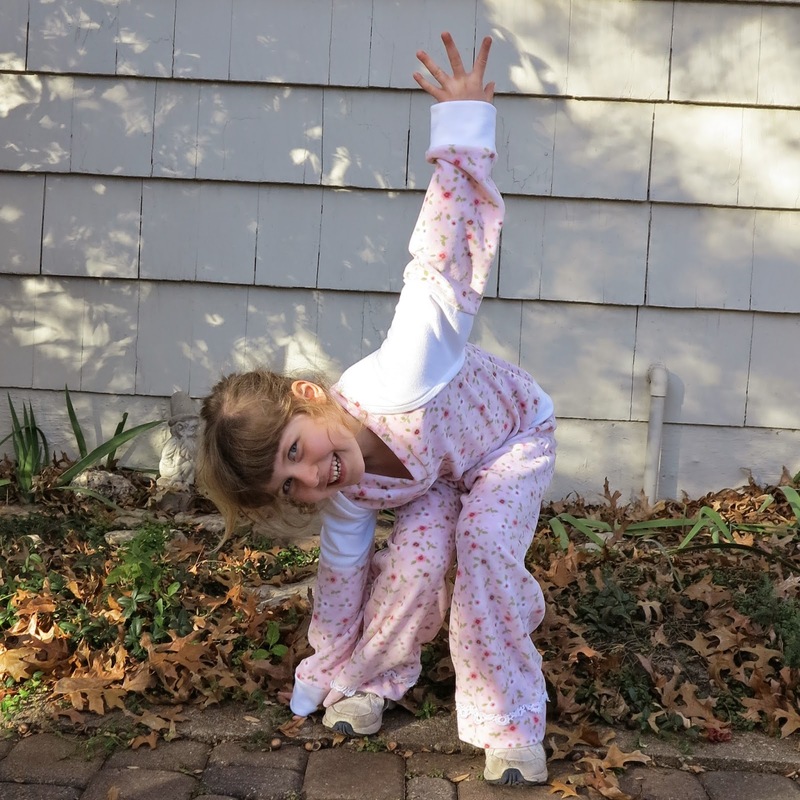 Miss Four loves her new Two-Piece Set-Acular, but I think we will be rolling those long sleeves up for a while yet. 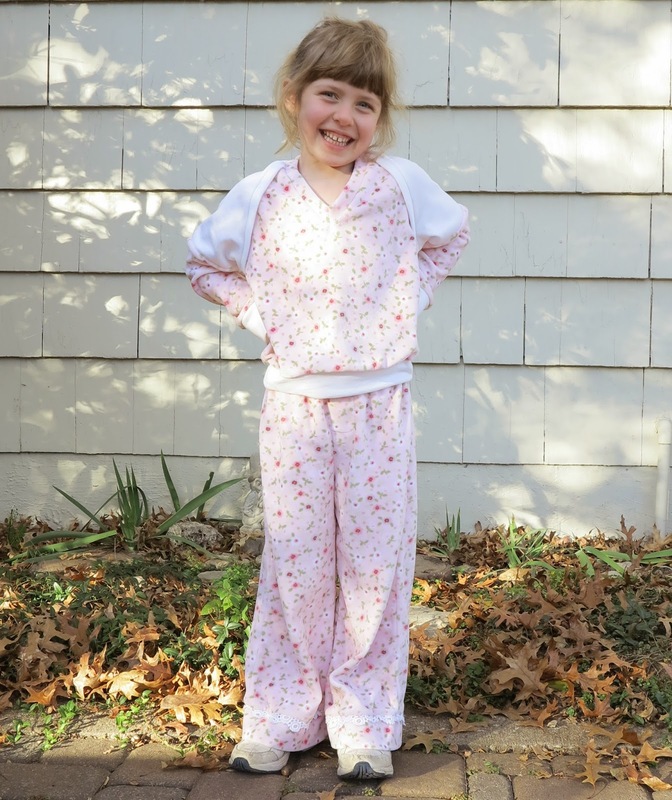 This entry was posted in cotton, Kwik Sew 1034, pants, pyjamas, top, velour on November 13, 2014 by Debbie Iles. As much as I’d like to sew myself fabulous, fashion pieces every day, other duties have been calling around these parts. I’ve been hard at work topping up wardrobe essentials, darning holes in woollens, and making Christmas gifts. It’s not the most exciting kind of sewing, but in doing so, I’ve been making use of a couple of TNT patterns for kids that have been worth their weight in gold. 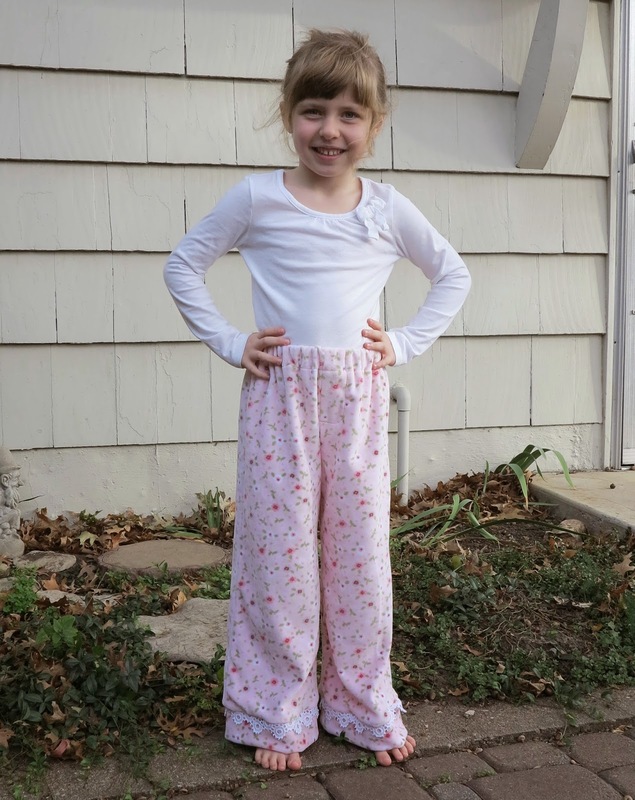 Miss Four desperately needed some easy, comfy pants to wear over her gym leotard and home from the pool. Tights just don’t work well for this job. 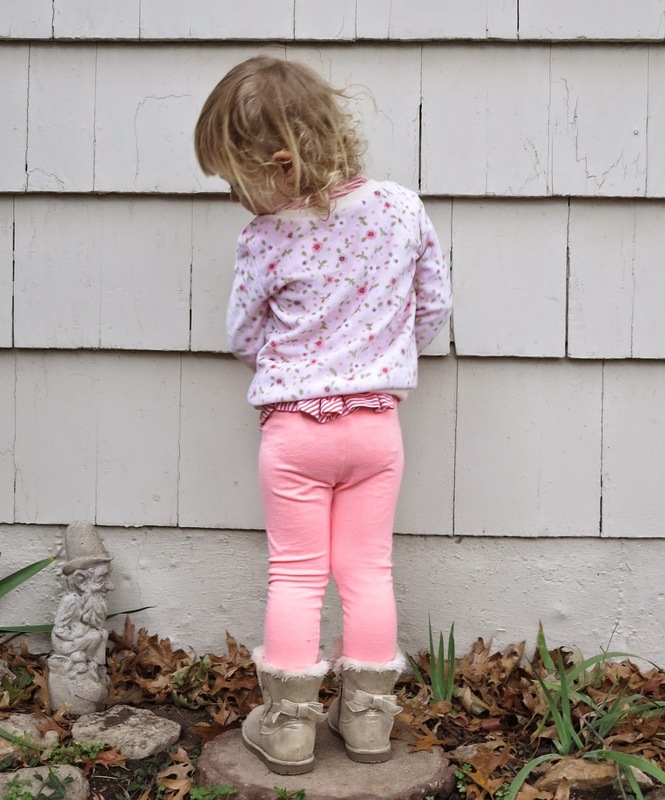 Now Miss Four doesn’t do pants, unless they are covered with a skirt. But she does apparently do cotton, floral velour. I would too. 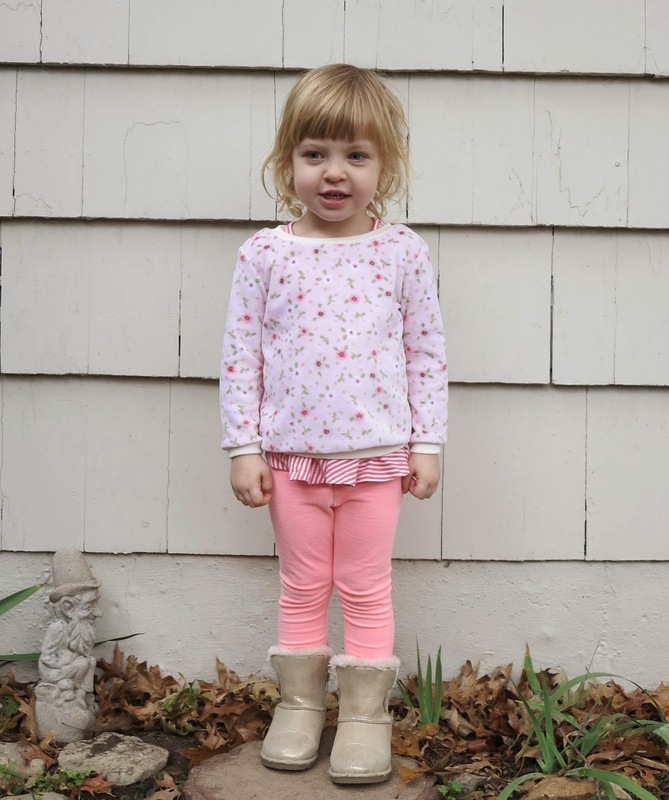 It’s the snuggliest, softest cotton and it should keep her little legs nice and warm. 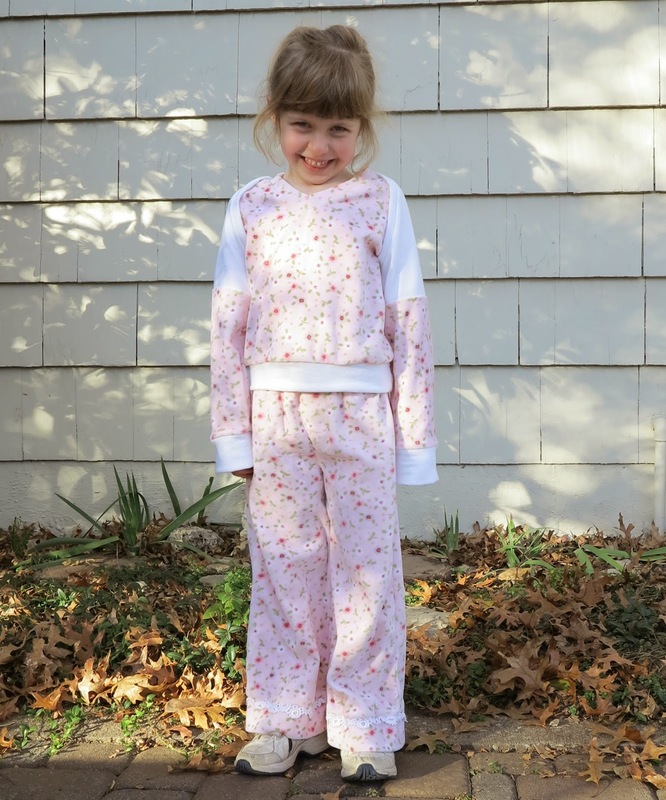 The pattern I used was M6633, the same pattern I used a while back to make Christmas pyjamas for my girls. I made them up in a size 5 for my exceptionally tall 4.5yo. The pants are very long. I shortened the bottom panel by about an inch but Miss Four still has to hike them up past her belly button to prevent them dragging on the ground. I added a little bit of leftover lace scraps to the hem and a false fly, partly as an attempt to lose the pyjama look. 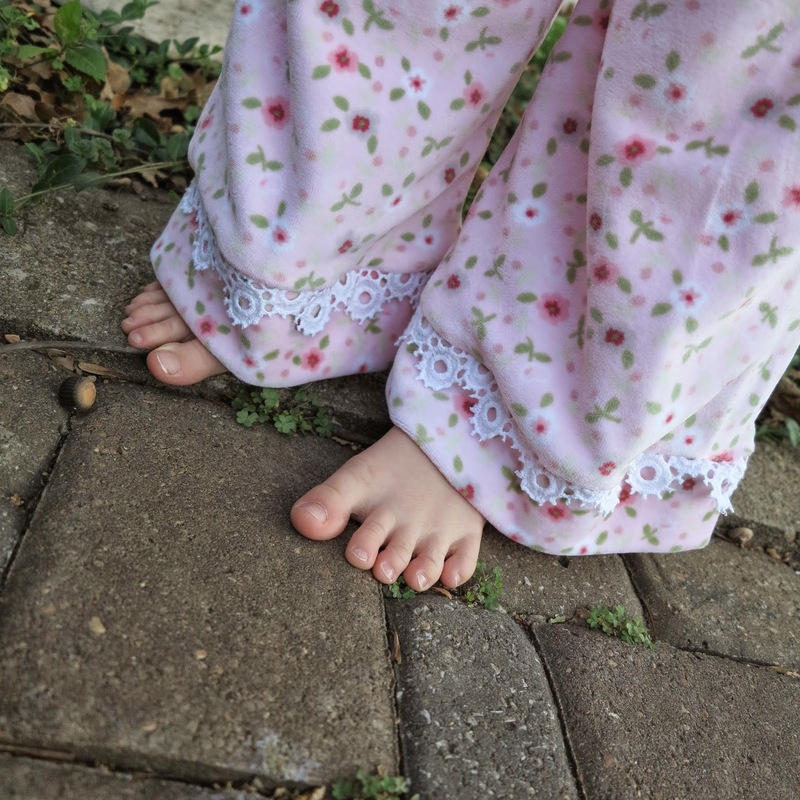 They still look like pyjamas to me, but I can’t argue with the little lady who has taken a liking to them. I’ll call it a score for me though since I managed to get her into pants. Miss very-nearly-three is a similar kettle of fish. 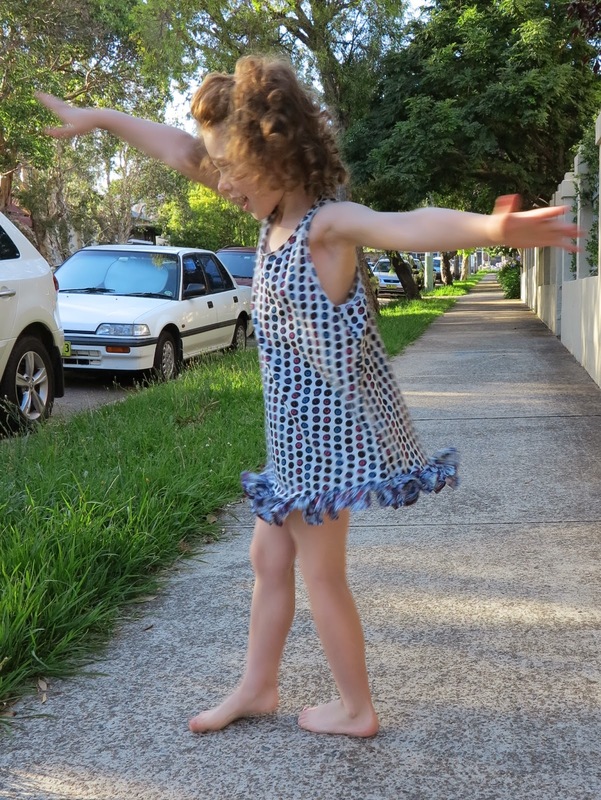 She insists on wearing sleeveless ballerina leotards and summer frocks in all kinds of weather (most often the dresses don’t even belong to her, having been raided from her sisters’ wardrobes). I layer her up and within a blink, she’s stripped down to the bare essentials again. She was short of long sleeve tops, so I thought I’d make her something pink and flowery that she might be inclined to keep on her little body. I’m afraid to say that I’m still having trouble keeping her fully clothed. I think she may be part Inuit. I used Simplicity 1435 for this top. It’s the fourth time I’ve used this pattern now. For this version, I used the same long sleeves that I’d modified earlier. I also lengthened the bodice by an inch and added contrast ribbing bands for the hem, neck and sleeve cuffs. 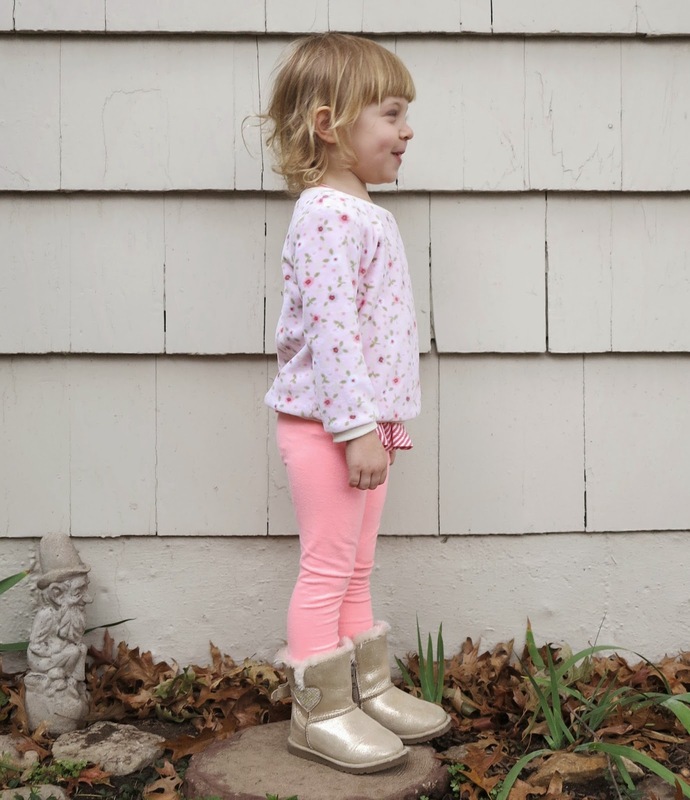 Size 3 is a perfect fit for my perfectly average-sized and scruffy haired very-nearly-three year old. 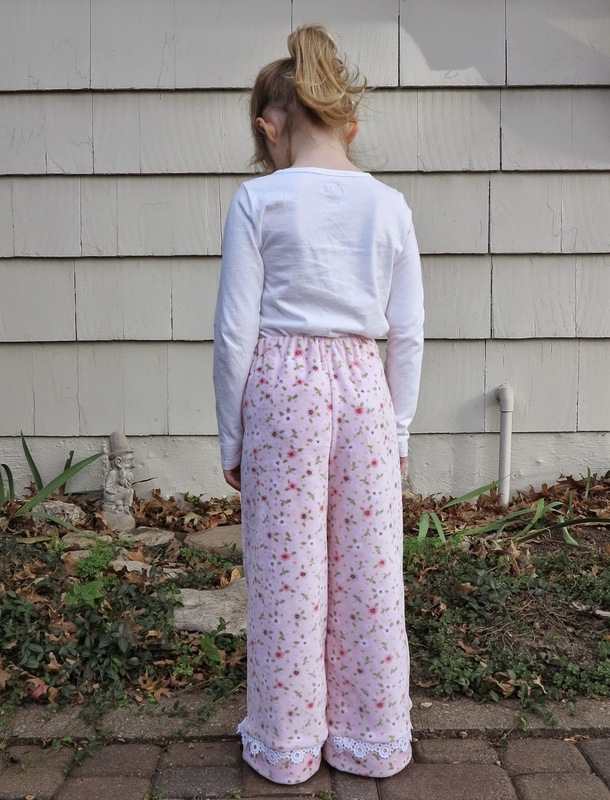 This entry was posted in cotton, M6633, pants, pyjamas, Simplicity 1435, top, velour on November 5, 2014 by Debbie Iles. I’ve been checking a few items off Santa’s list lately. I know, I know, it’s still stinking hot and we are nearly four months away from the big day, but I’ve got a good reason to start so early. The House of Iles has three birthdays plus Christmas to celebrate in the space of two months. It will also be our first Christmas in our new country, so we have absolutely no Christmas gear whatsoever. Adding to the excitement of a possible white Christmas, is the fact that we have a proper fireplace. It was also brought to my attention that there were already four little hooks above it. Naturally, Mrs Santa had to set about creating some little Christmas stockings. I chose a small selection of Christmas prints at Jo-Ann and let the girls choose the combinations that they liked best. The rest of the construction was done in secret. They will be packed away now until Christmas Eve. I appliqued the first letter of their names on the stockings so there would be no mind changing or arguments down the track. 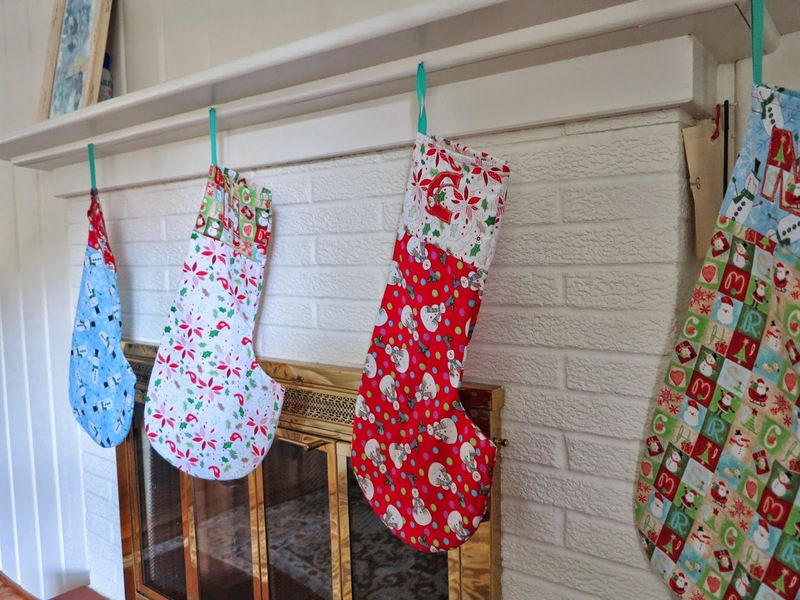 Miss Six will no doubt want to know how Santa knows which stocking is whose. 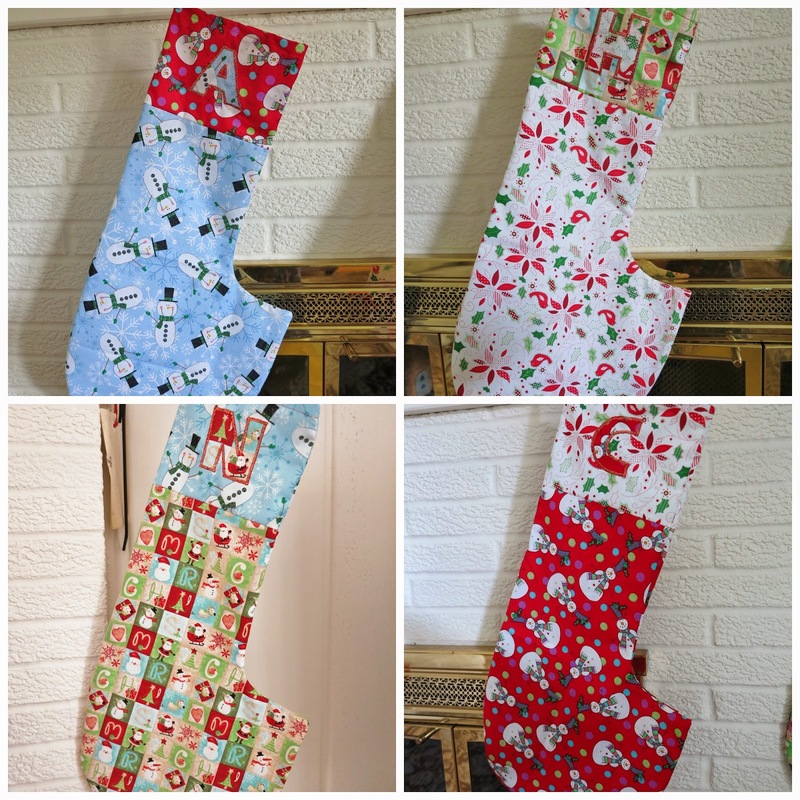 I had just enough fabric to make an extra stocking for Daddy too. 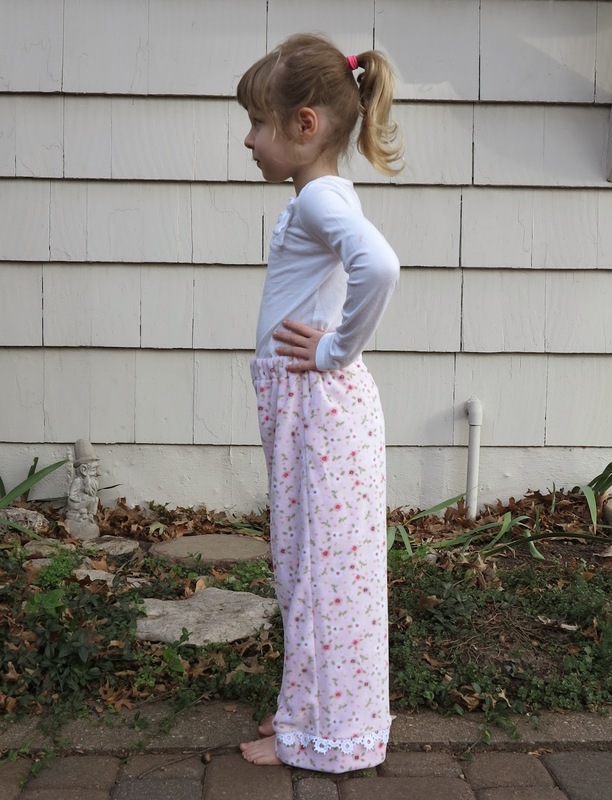 I also put on my sensible shoes and made the girls some flannelette PJ pants for Christmas. This was a seriously easy production line whiz bang bam on the serger. I used M6633 and made up a size 3, 5, and 6. I measured my girl’s waists to customise the elastic length. I know the pants will fit, but they still look quite large to me. I’m not too worried though. They will still be soft and warm. I have to admit that it was quite fun choosing a pretty print specifically to suit each girl’s taste. They are all so very different. 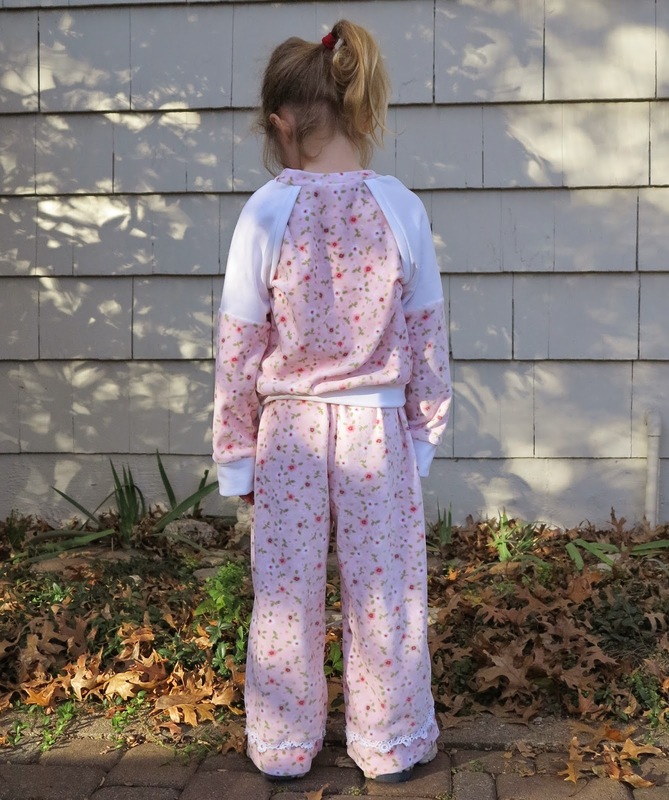 This entry was posted in Christmas, cotton, Jo-Ann, pyjamas on August 29, 2014 by Debbie Iles. Did I mention that I purchased 3m of that Marc Jacobs cotton knit fabric?! It would have been a good amount if not for the leg placement disaster of my own playsuit. But as it happened, I had enough for one more little top dress. I had been eyeballing the Little Truck Stop Top for months but finally decided to get out there and purchase it, even though I knew it was still going to be a few sizes too big for my littlest girl. As I’ve already mentioned, this little project was to use up the last bits of my Marc Jacobs knit. I also pieced together about six tiny lengths of some Liberty leftovers to make a beautiful bottom ruffle. I am a little obsessed with Liberty of London cotton right now so it might feature again pretty soon. I cut the pattern to a size 7. It is way too big but it doesn’t gape immodestly. Miss Coco has not yet decided whether she will wear it as a dress or a nightie to rival her swishing sister. And by the way, I managed to ‘roll’ the neck binding beautifully this time. I was so pleased with how it turned out after my earlier efforts, that I decided to push on and bind the sleeves before I went to bed. Wrong! I was obviously sleep-sewing. As you can see, I bound them the wrong way again so this is why there is no lovely ‘roll’ on the armscye. 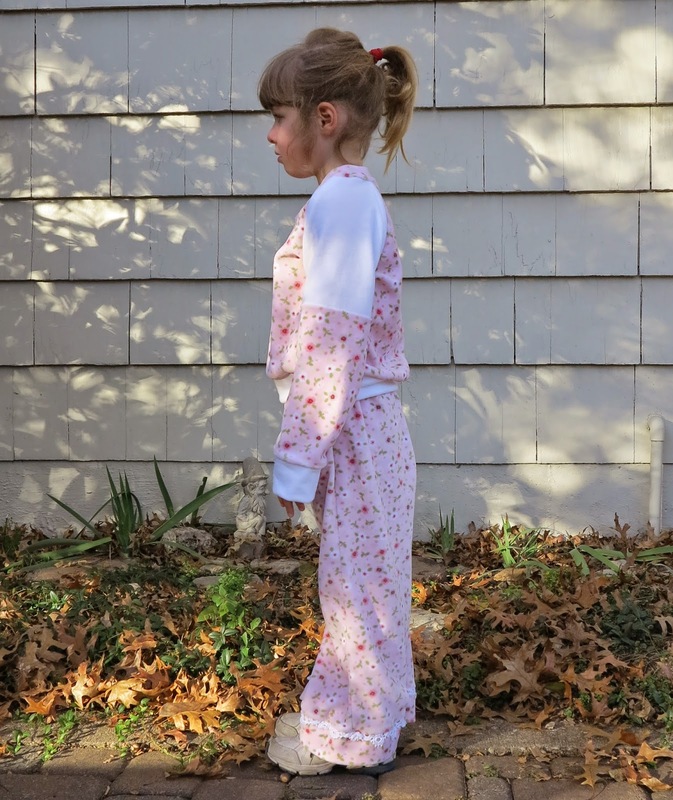 This entry was posted in cotton, dress, jersey, Liberty of London, Marc Jacobs, pyjamas, ruffles, Tessuti Fabrics, The Fabric Store, top on November 28, 2013 by Debbie Iles.